Oven performance is very good. 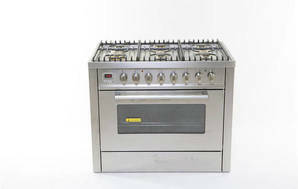 Cooktop and grill performance are good. Oven and cooktop are both OK.
Oven and grill shelves roll out smoothly. Grill shelf has no stoppers to prevent it being accidently pulled all the way out. Stainless steel exterior can show smudges.